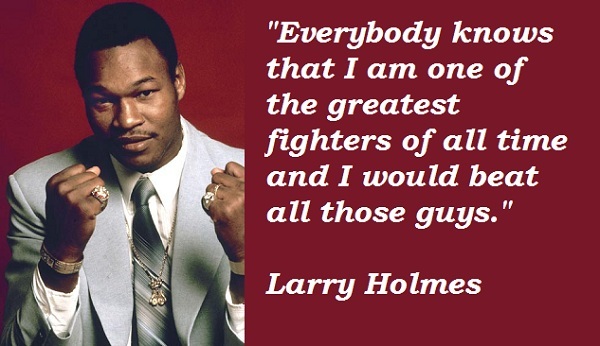 See the gallery for quotes by Larry Holmes. You can to use those 6 images of quotes as a desktop wallpapers. I'm not in the K-1 tournament. We thought about it but they really don't want me as they feel I might get hurt so that's fine with me but I do see a lot of guys out there that I feel I can take. We put our life on the line to fight for them, put on a show and these guys take our money so whatever happens to Bob Arum, Don King or anyone else is fine with me. With a record of 75 fights and 6 losses, some of the losses were very questionable including Brian Nielsen when we fought in Denmark. I knew I won but they didn't give me that fight. I never tried to be a mercenary or a killer but a hard working fighter. It's hard being black. You ever been black? I was black once - when I was poor. Ali was a guy that had a lot of discipline. If you hung around him, you'd be able to get some of that discipline that he had. And I learned from that. He was a sweet man. I don't really make plans and I just want to be happy and continue with my business and take care of my wife and kids. I want to sit back, relax and enjoy life. Mike Tyson would have been a good sparring partner for me and Muhammad Ali because Tyson was a fast fighter and he could punch and throw good combinations. Muhammad could take a very good punch. 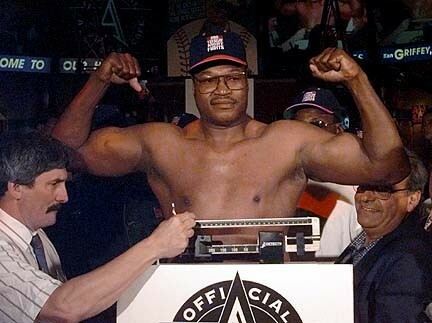 He was slick, he could move, he could hit, make you miss, good hand speed and combinations and one of the greatest fighters of all time in my opinion. 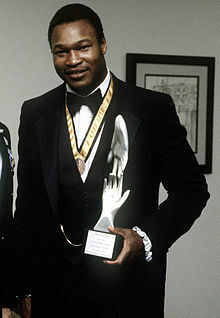 Everybody knows that I am one of the greatest fighters of all time and I would beat all those guys. I don't think Joe Louis could take the punches today fighting in this era. I still feel that I am in my prime right now but I think my best fights were in my thirties. 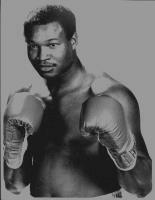 My fans know the name Larry Holmes and that he always gave it his all. One of the best ones out there was a guy named Howard Cosell. He was the best. 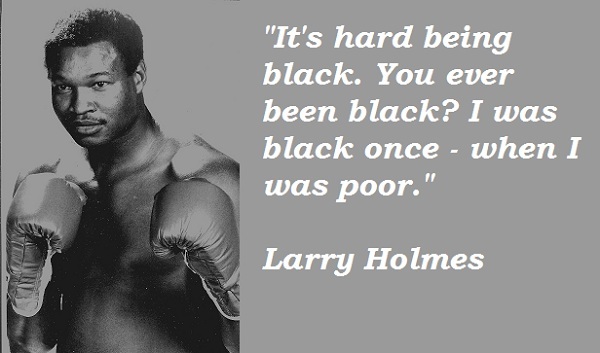 Much more quotes by Larry Holmes below the page. The guys today are just too strong and back then they would take many hard punches to land one. 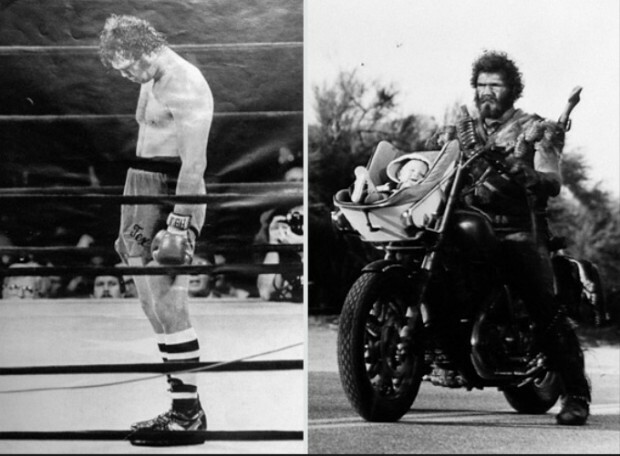 You can't put those guys like Marciano or anyone else in with today's class of fighters. Bob Arum and Don King can do their thing but if I fought for those guys and they put the money up like they are supposed to then I don't have a problem. I always felt good about myself. I was just an average person. I always felt I could do anything anyone else could. If an average person makes up their mind to do something, they can. I have a lot of friends and fans in Canada and as a matter of fact I met a fan from there that came down to my office. It was nice and we took pictures and had a nice talk. I think Ali was a fan of mine, even though he never said it. A lot of fighters thought I was pretty good. Nobody every really spoke different on that. But a lot of fighters thought I was good so. I was probably the best that ever walked this earth. And I could take a punch. I could deliver a punch. I didn't have the hardest punch in the world but my punches were sharp and they were crisp. And if you took too many of them, you would be knocked out. I would think about the outcome. Visualize sometimes. Because it never comes out the way you want it to. Fight the way I know how to fight. Whatever comes up, comes up. Man is the only creature whose emotions are entangled with his memory.